Parties can and do win elections on economic platforms opposed to austerity. When Justin Trudeau took over the ailing Liberal party in 2013, it was a rump that had lost three consecutive elections. Well into the 2015 electoral campaign, it was unclear whether it would even eke out a plurality, locked as it was in a tight race with the incumbent Conservative party and the social-democratic New Democratic Party (NDP). And the Liberals were daring to run on a strongly left-wing platform of Keynesian deficit spending, progressive taxation, disengagement from US-led military operations in the Middle East, and social liberalism – including the legalisation of marijuana. The Canadian election did not cause a tremendous stir in the United Kingdom. The parallels between the two countries and their parties are imperfect. Canada is in recession; the United Kingdom is not. The Canadian Liberals are, in terms of their background and party family, sisters to the Liberal Democrats, and not Labour (the NDP is the Canadian labour party, strictly speaking). 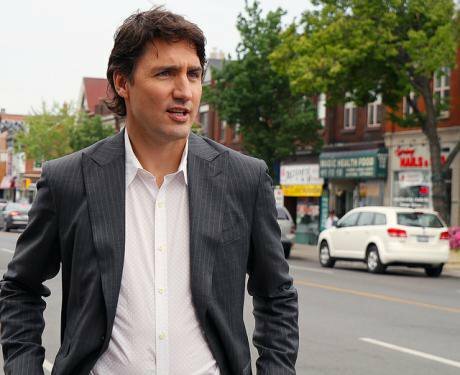 Trudeau is the scion of Canada’s most consequential prime minister, and The New York Post didn’t go far wrong in comparing him to the late John F Kennedy Jr. Corbyn was, until a few months ago, an obscure backbencher. But even given the very different contexts in which the two parties and the two leaders operate, the similarities between Labour and (Canadian) Liberal fiscal policies are transparently clear. Nor is a controversial fiscal policy the only challenge the two parties have in common. Below are four lessons that Corbyn’s Labour can learn from the Canadian elections. ...it’s clear that Keynesian policies were a vote winner for the Liberals.Canada has a long history of balanced-budget fetishism, going back to the 1990s. As David Frum recounts in The Atlantic, it was the last Liberal governments, those of Jean Chretien (1993-2003) and his finance minister and successor Paul Martin (2003-06) that first made balancing the federal budget the centrepiece of public policy. These governments cut spending, privatised public enterprises and, according to Frum and the Conservative finance minister Joe Oliver, adopted regressive taxation and pension measures. (Naomi Klein notes in The Shock Doctrine that Canadian financial interests and rating agencies pressured the Liberal government relentlessly in the 1990s to eliminate the deficit). Chretien and Martin ran surpluses for most of their tenures, though Martin increased federal spending to a considerable degree as premier. The Harper government inherited this commitment to fiscal rectitude, and preserved it – rhetorically. Actually, it ran deficits for most of its tenure, though in fairness this was partly due to the recession caused by the global financial crisis. Like the British Conservatives – both in their espousal of the evils of debt and deficit and their mixed record on actually reducing either – the Canadian Conservatives went into the 2015 election promising balanced budgets. Significantly, so did the social-democratic NDP and its leader, Thomas Mulcair. At this point, Canada had entered a mild recession due to falling commodity prices. Here we see the similarities with the British situation since 2010: a weak economy, a right-wing party committed to a tight fiscal policy, and a leftist party fearful of challenging its orthodoxy. There are some differences: Canada is currently entering a recession, while Britain, by the 2015 election, had left one, but the context of the political narrative is similar. And this is where Trudeau made his mark, and set an example for Corbyn. After testing the policy with focus groups earlier in 2015 (they approved if the policy was framed as investment), Trudeau promised to run modest deficits to invest in infrastructure and offset the business cycle. “Interest rates are at historic lows, our current infrastructure is ageing rapidly, and our economy is stuck in neutral. Now is the time to invest,” said the party platform, as quoted approvingly by uber-Keynesian Paul Krugman. If all this sounds familiar to British ears, it’s because that’s Labour’s policy too: though the party wants to balance the government’s day-to-day spending accounts, it also wants to run a deficit on the capital account and invest. The Liberals’ gambit worked. Their distinctive commitment to investment quickly gave the Liberals an edge over their NDP rivals, since Trudeau was able to claim to have “the most progressive platform” on offer. “Stephen Harper won't help you, and Tom Mulcair can't help you, because he's signed on to Harper's budget." Though there were other issues at play – the NDP was hurt in Quebec by its support for a woman who wanted to wear a niqab at her naturalisation ceremony – it’s clear that Keynesian policies were a vote winner for the Liberals. In a previous article for OpenDemocracy, I argued that Jeremy Corbyn and his brand of social democracy were “unelectable” if you considered the electorate to be fixed in size and preferences. Labour did better among younger and lower-income voters, but these don’t turn out in the same high proportions as more Conservative-leaning tranches. So the conventional wisdom is to move right. My argument was that Corbynism could indeed be electable if Labour instead focused on boosting turnout among its supporting classes. Justin Trudeau in fact managed this feat in Canada. Overall turnout rose significantly between 2011 (61.1 percent) and 2015 (68.5 percent). Elections Canada opened early voting locations on university and college campuses, which attracted 70,000 voters. It’s not wholly clear whether new voters, and which new voters, swung the election for Trudeau. Higher turnout did, obviously, correlate with a Liberal win, but the evidence is unclear as to whether it caused it. In general, higher turnout helps left-wing parties, especially where class is a major determinant of voting patterns (if you happen to be or know an academic, read more about that in this 1995 study here). Canadians, like Americans, are actually somewhat less prone to choose parties based on class identities, because class is a less important social identity in North America generally – in Britain, where class-based voting is more common, the effect is greater. voters who defect to nationalist movements may not do so forever, and that generational changes may lead them to return to the “federalist” or “unionist” mainstreamAnother problem the Canadian Liberals and British Labour had in common was their displacement by a secessionist movement in one influential part of the country. In the Canadian case, the Liberals had been marginalised in Quebec, off and on, for some time, first by the Conservatives’ surge in the 1980s and then by the rise of the Quebec nationalists’ federal wing, the Bloc Québécois, in the 1990s. The party recovered to win 36 seats in the province in 2000, only to be further discredited in the Francophone province by sleaze, specifically the “sponsorship scandal” in which funds for anti-independence campaigning were funnelled to party allies and, via them, back to the Liberals’ coffers. The Bloc collapsed in the 2011 elections, but Québécois voters chose the NDP, not the Liberals. In 2015, however, Trudeau managed to win back French Canada’s greatest bastion taking 40 of its 78 seats. The Canadian experience suggests that voters who defect to nationalist movements may not do so forever, and that generational changes may lead them to return to the “federalist” or “unionist” mainstream. (Ironically, Harper himself played a role in this by introducing a parliamentary motion recognising Quebec as a “nation” within a “united Canada,” which passed 265-18 in November 2006.) It also suggests that those voters might forgive and return to a party they once furiously rejected. Labour won’t be able to win a Westminster election again without winning Scotland; this at least suggests that such a victory is theoretically possible, though as yet Corbyn has made no headway there. One advantage the Canadian Liberals have is that they have, through Pierre Trudeau’s official multiculturalism, an alternative narrative of the Canadian nation that can rival Québécois nationalism and encompass the Québécois. No British party has come up with a positive case for the Union, or any strong narrative of British identity. The final lesson is that Corbyn will benefit from one factor totally outside his control, and that is the Conservatives’ long incumbency. By 2015, Harper had been in power for nearly 10 years. That alone militated against his re-election, and made a candidate promising “change” a much more attractive option. By 2020, the Tories will have been in power in Britain for … 10 years. And for those who say that British voters are simply more willing to keep one party in power for more than a decade (the Conservatives in 1951-64 and 1979-97; Labour in 1997-2010), Canada too has a history of extended one-party rule. The Conservatives last stint in power also lasted nine years (1984-93), while the Liberals once clocked up 22 years straight of incumbency (1935-57). None of this means Corbyn – or his successor as Labour leader, should he fail to hold onto office until 2020 – will necessarily win the next election because Trudeau won his. Justin Trudeau is the scion of the country’s chief political dynasty, a man in the public eye since birth and a far better national campaigner than Corbyn can aspire to be. There will never be tabloid websites gushing over photos of Corbyn like these. But the Canadian election has shown that a left-wing party can run on standard Keynesian policies and win – and that a left-wing party can run on “good” fiscal management and lose.